Whisper it quietly but are the Italians really that good when it comes to desserts? After the simple refinement of the pasta, meat and salad, the arrival of the sweet trolley is all too often a sensory overload of cream, sugar and chocolate that leaves many diners opting for an espresso and perhaps a glass of grappa to end the evening. Nevertheless, names such as tiramisu, zabaglione, panna cotta, even the rather eccentric zuppa inglese, or English soup, are some of the more recognisable examples of Italian cooking. Then there are the myriad torte, or cakes, that contain various varieties and combinations of nuts, dried and fresh fruit, cream and cheese such as ricotta. So perhaps it doesn’t pay to be too sniffy. At the heart of the peninsula’s love affair with cream and sugar is ice cream, or gelato. Ask any returning visitor what is their abiding memory of an early summer’s evening in an Italian town and they will describe the procession, or passeggiata, of the locals, children running around the legs of their parents and relatives, all carrying a cornetto, or cone, topped with chocolate, strawberry or vanilla, even tutti frutti. 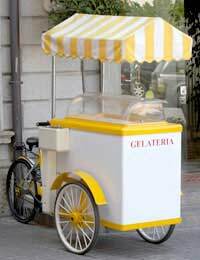 Whereas northern Europeans will pop out in couples or as part of a group for an alcoholic beverage or two, Italians find the social life of the gelateria an equally convivial meeting point. In the restaurant environment, they have even been ingenious to combine both the sweet and coffee course in the gelato affogato al caffe which in all its various forms remains at heart a scoop of ice cream bathed in a cup of espresso coffee. But let’s return to zabaglione as an effective introduction to the Italian sweet tooth. Add 100 mls of a dessert wine such as marsala or moscato, then heat the mixture, stirring constantly, in a bain marie i.e. a dry bowl or pan suspended oven another filled with boiling water for about 15 minutes or until the egg yolks have cooked and the contents of the bowl have developed into a custard-like sauceThen simply pour a portion into each of four wine glasses and serve. A dessert wine such as moscato would make a fine accompaniment to the zabaglione; similarly a panna cotta, literally cooked cream, would appreciate the wine, too. For presentation purposes, the panna cotta can be removed from the ramekin by briefly dipping the bottom in a tray of boiling water, then inverting onto the serving plate.